Beijing (People’s Daily) - The Paulson Institute announced on Thursday the launch of its annual award to encourage innovative solution for sustainable development in China. 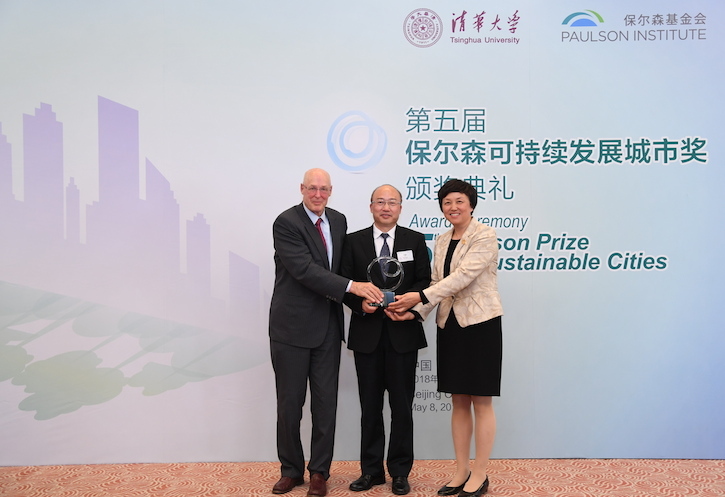 The Chicago-based think tank will continue to team up with Beijing’s Tsinghua University for Paulson Prize for Sustainability in China. Given China’s rise to an influential climate change leader in the world, the country’s experience and home-grown solutions could make contributions to facilitating the world’s sustainable development, said Yu Jiang, chief representative with the Beijing office of the Paulson Institute. Launched in 2013, the program has annually awarded cutting-edge approaches to sustainable urbanization in China that represent innovative, scalable and market-based solutions with both economic and environmental incentives. The latest winner, a bio-based lubricating oil project in southeast China’s Zhejiang Province, was honored for providing a cost-effective alternative to traditional fossil fuel-based lubricants. The think tank believes the project has potential to raise fuel efficiency and reduce emission of nitrogen oxide, significant greenhouse gases playing a key role in climate change. China has promised to continue to cut nitrogen oxide emissions by 3 percent this year. This year’s Paulson Prize will focus on projects dealing with the urban environment, circular economy, natural capital, as well as other projects that contribute to the balance between economic development and environmental protection, said the institute.